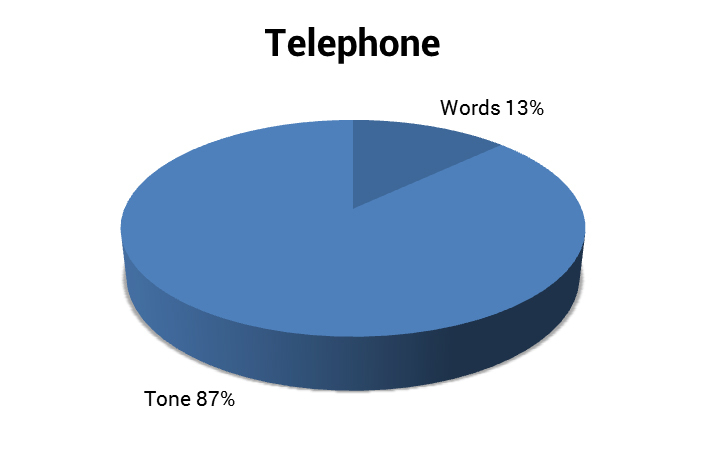 Words can only say so much – it is the way in which your words are said that really matter, especially over the phone. The tone of someone’s voice tells us a lot about them. For example, we can tell if they are having a good day or a bad day, and if they are annoyed or happy to be a part of the conversation. More or less, we all do this type of assessment on a daily basis, and researchers have noticed. There are volumes of work relating to the importance of all sorts of communication avenues, but here – I am focused on the role of tone. Albert Mehrabain’s original experiments dealing with communication of feelings and attitudes found that people use three resources to determine likeability and trust: Body Language, Words and Tone. 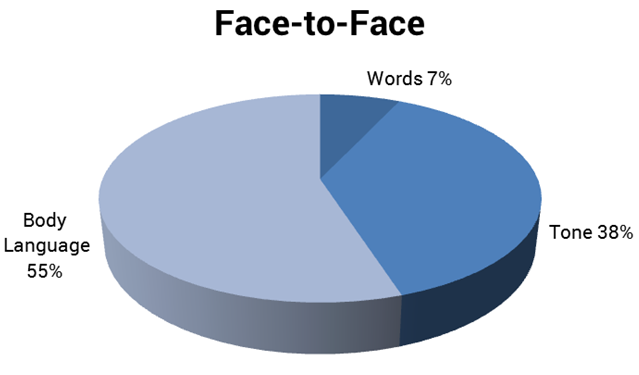 Now, the exact percentages vary depending on the research, but the trend is the same: Body language dominates communication of attitudes in a face-to-face environment. Tone plays a large role also, and surprisingly, words mean very little when assessing someone’s likeability and trust. The resources change in a telephone communication – you do not have the luxury of visual input, so tone skyrockets to become the key factor in our decision to like and trust the person on the other end of the line. Words gain some importance, but not enough to become the deciding factor. The tone of someone’s voice is what we use to decide if we like them, if we trust them, and ultimately, if we want to do business with them. Think about this scenario: Thousands of dollars have been spent on advertising. The internet and five neighboring cities have been blanketed with the best ad campaign ever. Your phones are finally starting to ring. Staff is in place and ready to go…and then you hear it. The entry-level call handler just answered the phone for the first time. Sure, they followed the script, but that’s not how it sounded when you wrote it. Even the simple greeting that your call handler uses when answering the phone, which are the first words that your caller will hear, can have vastly different implications all dependent on the tone of your call handler’s voice. Imagine hearing someone answering the phone this way with a cheery tone, smiling as they speak. You want to talk to this person. Now imagine hearing the same greeting from someone who sounds blasé, like they just woke up. You’d probably think that despite their words, they actually couldn’t really care less about helping you. It’s not what they said, it is how they said it! Remember to spend a little time listening just to tone when reviewing your call handler’s recorded calls. Yes, you have to use the right words, but the way those words are spoken truly makes all the difference. Tone is the determining factor when your potential customers judge your company for likeability and trust during that first phone call.